David Liebman: saxophone; Jeff Coffin: saxophone; Victor Wooten: bass; Chester Thompson: drums; James daSilva: guitar; Chris Walters: keyboards. This live set opens with Liebman giving some background to the pieces he has arranged for his band. “…with Miles Davis you’ve got to be very selective when you’re talking about him…like guys who have had long careers and always kept changing. In Miles case, you know, you had the acoustic jazz and then when he started the electric thing…it was really a revolution. Not welcomed by the purists but the young people really identified with it. 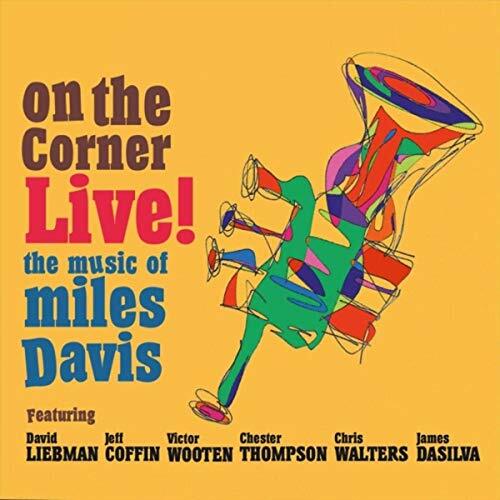 And Miles got another life out of it.” I suppose it is a little odd to see an album of Miles’ songs and not have a trumpet player listed. Of course, in much of his electric period Miles was using effects pedals to disguise the sound of his horn anyway. Liebman (who has intimate knowledge of playing many of these tunes from their inception) and Coffin are such adaptable sax players that the lack of trumpet is not noticeable. To further emphasise the credentials of this as a band who are able to mine the deep vein of experimental rock that underpins (and arose from) Miles’ electric work, the band features a drummer who is well-known from his time with The Mothers of Invention, and to keep the funk heavy there is a bassist who has played with Bootsy Collins and Prince (listen out for tremendous ‘bass interlude’, track 5, which not only highlights Wooten’s talent but also brings in the ghosts of several of the great bass players who played with Miles in the ‘70s). ​If I just list the tracks, the enthusiast will already be placing an order for this marvellous reimagining of some of the most essential tunes from Davis’ catalogue: ‘In a silent way’ (track 2), ‘On the corner’ (track 3), ‘Black satin’ (track 6), ‘Selim’ (track 7), ‘Ife’ (track 9) and closing, of course, with ‘Jean Pierre’ (track 12) as Davis used to end his live shows. From this listing you can see how Liebman and is fellow bandmates are mining not just On the Corner, but also In a Silent Way, and Live-Evil. What you can get, from a list of tunes, is the way in which the arrangements not only work the main themes of these tunes but also convey the underlying sense of purpose that Davis was working with at the time. With the addition of younger bandmates, on keyboard and piano, there is also also a feeling that the tunes themselves have journeyed through the intervening years, gather different rhythms and hooks, so that the band brings these tunes into a contemporary context. As Liebman says, “The songs chosen are not all from the original recording, but overall the material I chose represents a look at the electric period of Miles Davis which certainly changed the course of pop music and jazz forever.” I can’t argue with this aim and recommend this recording to anyone who loves electric Miles – and to anyone who loves jazz.